Voya has released new research that examines Americans’ retirement preparation efforts. Visit here. November 26, 2018 — NEW YORK–(BUSINESS WIRE)–Voya Financial, Inc. (NYSE: VOYA), understands that Americans need holistic guidance to help them prepare for, transition into and live out their retirement. As part of its ongoing effort to help individuals and families achieve long-term financial security, Voya has released new research that examines Americans’ retirement preparation efforts. The results also identify ways that working with a financial advisor can help Americans make wiser, more-informed decisions. The transition into retirement involves various financial, emotional and social choices, and a financial advisor can act as a sounding board, helping his or her clients make pivotal decisions and setting them on the right path toward success. Not surprisingly, Voya’s research showed that people who work with a professional are significantly more prepared for a range of financial decisions in retirement compared to those who go it alone. Several key findings, outlined below, signal a need for Americans to seek out professional advice, particularly as they approach retirement. Working with a financial advisor can lead to better budgeting and, therefore, potentially better outcomes in retirement. Many pre-retirees don’t realize that budgeting can begin approximately 10 years before retirement, or around age 55. Voya’s research showed that individuals without an advisor are postponing the budgeting process, sometimes until the same year they retire. Financial advisors can provide guidance so that people are prepared for daily spending decisions, health care costs and other living expenses in advance of retirement. 94 percent of individuals surveyed who work with an advisor feel at least somewhat prepared when it comes to making decisions about estimating their monthly income in retirement. On the other hand, 42 percent of individuals surveyed without an advisor don’t feel prepared at all to make these decisions. 80 percent of individuals with an advisor feel at least somewhat prepared when it comes to estimating health care costs in retirement, while almost half (48 percent) of individuals without an advisor do not feel prepared at all when it comes to this. Half (50 percent) of individuals who work with an advisor plan to learn more about calculating their expected monthly living expenses at least five years before their target retirement date. Only 39 percent of individuals who don’t work with an advisor plan to do so at this time. Furthermore, 19 percent of individuals who don’t work with an advisor plan to wait up until the year they retire to calculate these expenses. As individuals prepare for retirement, they may want to take steps to make sure their assets are protected against potential economic downturns. They also may want strategies to eventually draw down money from retirement accounts, in a way that avoids financial penalties from withdrawing too early or too late. Voya’s research identified a significant gap between those who do and do not work with a financial advisor, in relation to knowledge of investment and retirement income strategies. 76 percent of individuals with an advisor plan to make adjustments to their investments leading up to retirement, compared to 35 percent of individuals who don’t work with an advisor. 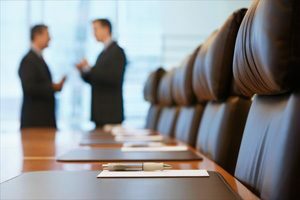 40 percent of individuals who work with an advisor plan to adjust their investments with a focus on protecting their assets, compared to 18 percent of those who do not work with one. 57 percent of people who work with an advisor feel very prepared when it comes to making decisions about withdrawing money from a retirement plan in a way that avoids financial penalties from withdrawing too early or too late, compared to only one-quarter (22 percent) of those who do not have an advisor. Nearly half (46 percent) of individuals surveyed who work with an advisor feel very prepared when it comes to making decisions about catch-up contributions. On the other hand, 53 percent of individuals who don’t have an advisor say they don’t feel prepared at all to make this decision. Financial advisors are preparing their clients — not just for financial aspects of the transition into retirement but also for the social and emotional aspects. Voya’s survey research suggests that individuals who are not receiving advice from a professional are not adequately preparing for the impact retirement will have on many aspects of their lifestyle. 83 percent of individuals with an advisor have thought about how they will fill their time in retirement, compared to 56 percent of those without an advisor. Nearly all (92 percent) of those surveyed who work with an advisor believe they should be thinking about housing in retirement, compared to 78 percent of their peers without an advisor. 26 percent of individuals with an advisor have saved money to cover the cost of housing/eldercare expenses or have purchased a product like long-term care insurance. Only 9 percent of individuals who do not work with an advisor have taken these steps. 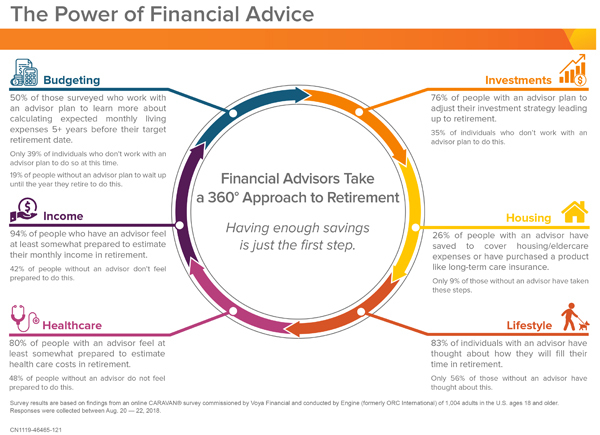 For more information about saving for retirement and working with a financial advisor, visit Voya’s website at voya.com/contact-us/find-a-pro. Survey results are based on findings from an online CARAVAN® survey commissioned by Voya Financial and conducted by Engine (formerly ORC International) of 1,004 adults in the U.S. ages 18 and older. Responses were collected between Aug. 20 — 22, 2018. * Investment adviser representative and registered representative of, and securities and investment advisory services offered through, Voya Financial Advisors, Inc. (member SIPC). Voya Financial, Inc. (NYSE: VOYA), helps Americans plan, invest and protect their savings — to get ready to retire better. Serving the financial needs of approximately 14.3 million individual and institutional customers in the United States, Voya is a Fortune 500 company that had $8.6 billion in revenue in 2017. The company had $543 billion in total assets under management and administration as of September 30, 2018. With a clear mission to make a secure financial future possible — one person, one family, one institution at a time — Voya’s vision is to be America’s Retirement Company®. Certified as a “Great Place to Work” by the Great Place to Work® Institute, Voya is equally committed to conducting business in a way that is socially, environmentally, economically and ethically responsible. Voya has been recognized as one of the 2018 World’s Most Ethical Companies® by the Ethisphere Institute; one of the 2018 World’s Most Admired Companies by Fortune magazine; as a member of the Bloomberg Gender Equality Index; and as a “Best Place to Work for Disability Inclusion” on the Disability Equality Index by Disability:IN. For more information, visit voya.com. Follow Voya Financial on Facebook, LinkedIn and Twitter @Voya.